On our last night in Rio we went to one of Brazil’s famous churrasco restaurants for Brazilian BBQ. We came to the conclusion that this type of restaurant would be a vegetarian’s nightmare! We picked a lively spot on the Copacabana, recommended by our hotel. The bright place had a modern interior, filled with tile mirrors and long communal tables. Upbeat dance music played loudly in the background. The place was crowded and it was still early. The instance we sat down, the food started pouring out of the kitchen, plate after plate. First up was some light appetizers – hearts of palm, cheese, olives, bread, and tomatoes. Then came the meat… and it kept coming and coming and coming! The smiling waiters would parade out of the kitchen carrying a large skewer filled with dripping meat fresh off the BBQ. Each skewer was a different cut of beef or pork. They also threw in a hint of chicken just for kicks. At our table, with one hand holding the skewer and the other hand a sharp knife, the waiter would rattle off in Portuguese the type of meat and start to cut. Juicy pieces of steak would slide off the rump and on to my plate. This process continued for well over 45 minutes. If I’d refuse a piece, the kind waiter would give me a little wink, and just cut a smaller slice instead. Finally, the skewers of meat stopped coming. Of course I thought we were through, but then a round of fish skewers arrived. Although the fish was just as delicious as the meat, I could sadly only manage to eat one more bite. As we looked around the room, completely stuffed, we laughed at the indulgent experience. 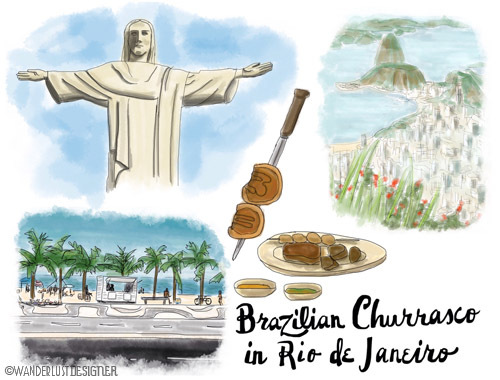 We wondered if a vegetarian tourist had ever decided to give this type of Brazilian fare a try and what his or her thoughts would have been. I can’t imagine it would have been a favorite! We also joked about whether a heart doctor would show up to pass around his card given our feast of red meat. After paying the bill, we headed out to the famous Copacabana beach to stroll back to our hotel and attempt to digest. We met up with a vendor and haggled about his t-shirt prices a bit, then sat down on the beach and watched the huge waves roll in. With a full belly and a pleasant 80+ degree temperature we agreed the churrasco meal was a fitting end to our Rio adventure. The meal embodied the feeling we had experienced on our visit. The lively atmosphere of the restaurant, the smiling waiters and the spectacular meal presentation reminded us of the lively atmosphere on the streets of Rio, the friendly citizens we met and the spectacular views we experienced. Definitely both experiences are not to be missed when visiting Rio de Janeiro.